Every day the Galerij Prins Willem V is opened, the painter comes in first and goes out last. And that does not remain without noticeable consequences.The fine odors of natural turpentine and linseed oil give this oldest picture gallery of the country the deserved perfume it also must have had in the past centuries, when innumerable copyists and art academy pupils were able to study these collected works of the great masters from up close. 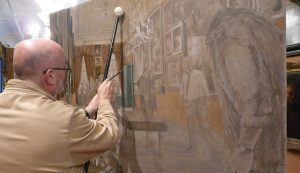 With this special CONTERFEYTER project situated in the heart of the gallery, again and of course with thanks to the museum’s directorate and staff, this illustrious tradition seems revived once again. At this stage of the painting process, it has become due time to start depicting all the lacquered wooden elements of the interior, like the frame around the niche with the eighteenth century ceramic stove, the profiled door post, the skirting boards, the two windows, its paneling underneath and of course both of the entrance doors. Evidently, this phase of the working process also requires some very different colours on the painter’s palette. Both malachite and azurite are quite familiar pigments, actually pulverized semi precious stones, originating from a natural reaction in copper-containing rocks. The specific blue-green colour of the gallery’s interior was very fashionable in the middle of the eighteenth century, when it was erected. At that time, the Galerij Prins Willem V was a modernistic novelty in the Netherlands, being the first public art collection in the country, where this illustrious painting collection, of course strictly according to standards of that time, could be symmetrically arranged and compacted, literally from floor-to-ceiling. 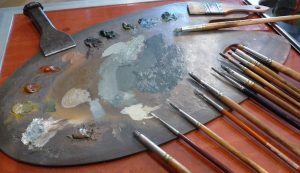 It goes without saying that each part of the painting process of this new CONTERFEYTER picture asks for the right tools, which of course is always depending on the preferences of each individual painter. 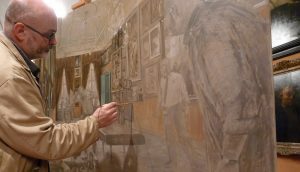 For example in the case of René klarenbeek, as was previously demonstrated, also to obtain the right ‘impasto’, he prefers working during the entire ‘doodverf’-stage with his rather stiff pig hair brushes. During the following ‘work-up’-stage with the subsequently added typical colours of the seventeenth base palette, evidently this painter turned to a set of fine soft ox-hair brushes. Nonetheless, especially the accurate painting of long straight lines can best be done with an even finer brush. Both the length and the fine texture of the long-haired marter brush makes it particularly suitable for this type of execution. While painting a line, the brush should be held at the end of the stem between two fingers and moved slowly downwards, which allows the long hairs of the brush to nothing else but following this movement in a straight line down. In the past centuries, these extremely fine brushes were nor only used by artists, but also by specialist furniture painters, who used them for accentuating the contour lines on, for instance, panel doors and cabinets. Another specific, very handy and unfortunately almost disappeared painter’s tool is the in previous centuries extensively used ‘maalstok’ (also mahlstick or maulstick), with a soft ball at the top covered with leather or fine linen. 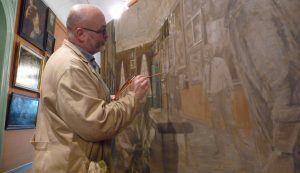 It is very useful to support the painting hand wearing a brush and is especially very practical when painting straight lines. In several of the old master’s self-portraits, the ‘maalstok’ is often specifically displayed as part of the painter’s most recognizable equipment. 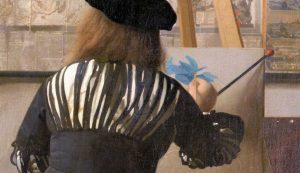 A fine example of this is Johannes Vermeer’s self-depiction seen from the back in his ‘Allegory of painting’ from 1665, here shown in detail while using his ‘maalstok’. 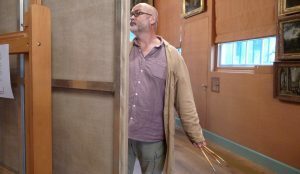 In his new DIOGENES-painting, René Klarenbeek uses his extended ‘maalstok’ to increase the steadiness of the painter’s hand, by supporting its weight during painting, here working on the light reflections on the heavily paneled entrance doors and door post, which are separating the large gallery space from the smaller one, the so called ‘anti-chambre’, at the entrance of the museum adjacent to the old stairwell. Like we have seen on the north wall, also this side of the gallery is just as much luxuriantly filled with an overflow of different paintings, as used to be very fashionable during the eighteenth century. 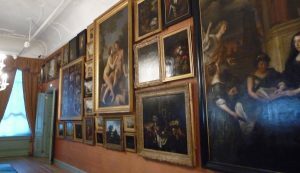 The exhibited works in this corner are of famous masters such as Michael Sweerts, Jan Steen, Willem van Aelst, Jan Lievens and Philips Wouwerman. The large painting on the right hand side of the door, called “Interior with figures in a Picture Gallery”, is of the Antwerp born (and deceased) master Gonzalo Cocx, better known as Gonzales Coques (ca 1614 / 1618 – 1684) while working in close co-operation Dirk van Delen (circa 1604 / 1605 – 1671) and many other artists of the time. The last additions of this remarkable collective patchwork painting, showing an assembled gathering of rather small scale copies of an undoubtedly once existing collection, situated in this large scale but nonetheless imagined picture gallery, were added by other hands not earlier than 1706, long after the death of Coques and Van Delen. Unfortunately, the large ‘Coques’-painting as seen from the painter’s view point remains almost invisible due to the raking light reflection of extensive day light coming from both of the windows, the composition of this picture must be accurately painted in first. Only after that phase will be fully completed, René Klarenbeek’s rather large ox-hair brush filled with diluted lead white can be carefully pulled through the still wet oil paint, blending it in and almost wiping it out, in an attempt to suggest the overwhelming day light reflection. But that part will come later. Nonetheless, although it always should be prevented if possible, especially when the subject is right in front it’s painter face, at some times photographs are inevitable to work from. To record the actual impression of the ‘Coques’-painting from the accurate view point, the above photo was made at 11:50 hrs. That was just before the gallery would be opened to the public and therefore the window’s roller blinds had to be take up. Of course, right after that, this marvelous sight was gone. 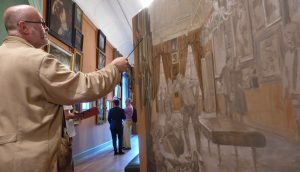 The Mauritshuis is very fortunate to have its own restoration studio, where a team of restaurators is permanently engaged with conservation, restoration and material engineering research. In this photograph Sabrina Meloni, one of the museum’s conservators, shows that nowadays a large part of the gathered knowledge also comes through the computer screen. A lot of what we have learned about the old master’s paintings was built up thanks to of careful examination of, for instance, x-ray images, showing in particular the underlying layers which previously, at the time of its origin, were carefully covered up after the painter had corrected himself – or simply had changed his mind. Although these alterations were certainly not intended for our eyes to see, we are very fortunate now that we are able to do so. By this we have learned a lot about the working methods of the old masters and especially about their so called ‘pentimenti’, self corrections in both composition and details. Because the entire painting process of René Klarenbeek in the Galerij Prins Willem V is permanently recorded with a camera, in this case x-ray’s will not be really necessary to demonstrate quite a ‘pentimento’ in the painting’s composition by rigorously adapting the size of the two visitors discussing with each other in front of Caesar of Everdingen’s ‘Diogenes’. Only after this has been corrected, the filling in of the different framed pictures, like the Mijndert Hobbema and the Willem Kalf, on the gallery wall can be continued.